President Yoweri Museveni has challenged Ugandans and the youth in particular to appreciate the goodness in keeping their culture and heritage in the face of modernity in order to sustain the stability of their cultural traits. 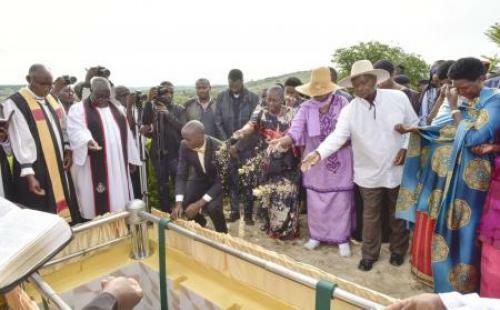 The President, who was accompanied by the 1st Lady, Mrs. Janet Museveni, was speaking at the burial and celebration of the life of his late paternal uncle, Eriya Riisi, that took place this afternoon in Ruhunga Parish of Rubaya Sub-County, Kashaari County in Mbarara district. Mzee Eriya Riisi died in Kampala mid this week in Kampala at the age of 94 years. Parliamentary Speaker, Rt. Hon. Rebecca Kadaga, urged the people to emulate the late Mzee Riisi for his wisdom to accumulate family wealth with minimum level education.